Garlic, one of the most popular seasoning herbs, is also a potent antibiotic and cholesterol-regulator. Learn more about its history, characteristics, and uses. Garlic, a perennial herb originally from Central Asia, has been one of the most popular seasoning herbs for centuries. In fact, it was one of the first crops domesticated by humans, as early as 5,000 years ago. Its medicinal uses are believed to be ancient as well, as it was mentioned in medical documents dating back to Babylonia and Ancient Egypt, where it is listed as both a treatment for wounds or infections and a staple food that can increase vigor. 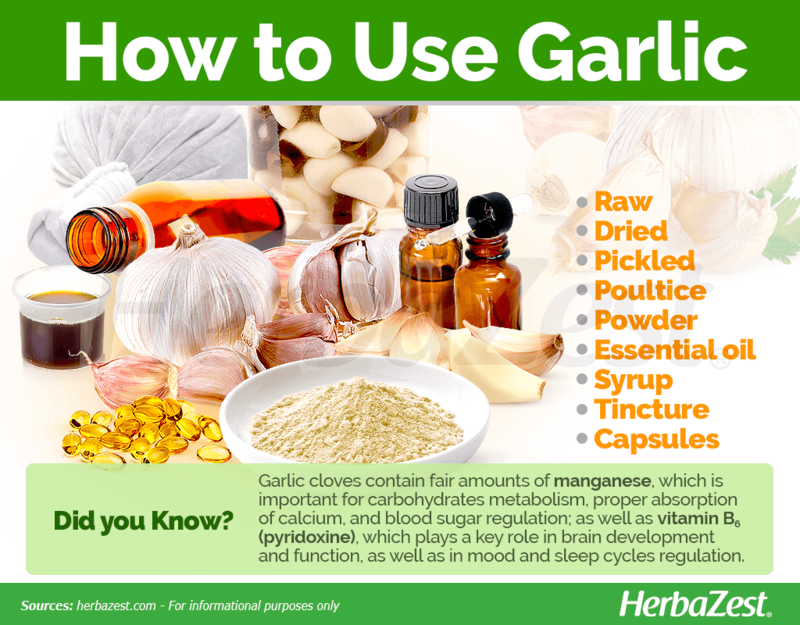 Ever since, different branches of traditional medicine and scientific studies have pointed to garlic as an antibiotic agent, immunity booster, and a blood pressure regulator. Garlic is one of the most used and well-researched medicinal herbs. 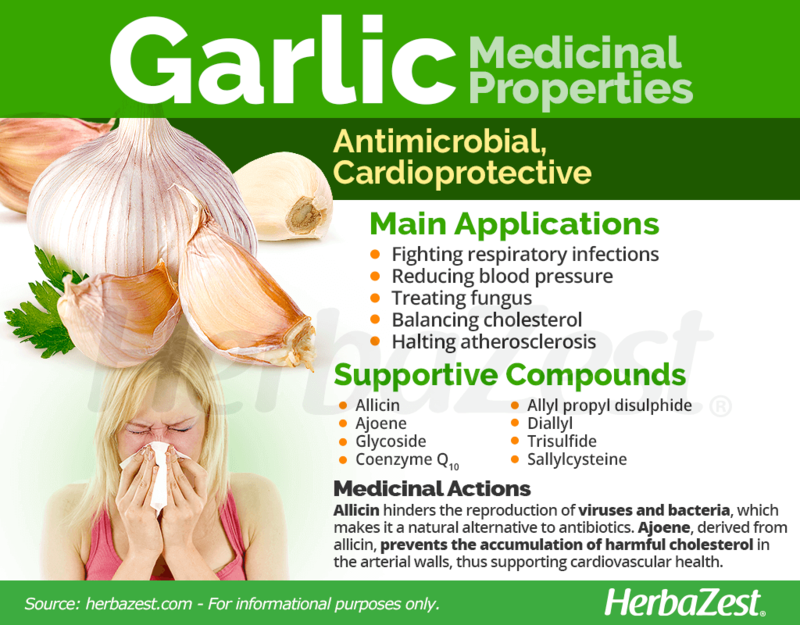 Thousands of studies have been done on garlic and allicin, and its effects on the cardiovascular system, infections, the respiratory system, blood sugar, and more. Fighting respiratory infections. Its antibiotic properties render it useful for throat infections and amygdalitis. Reducing blood pressure. The aromatic compounds in garlic work in the body as many aromatics do: by dilating blood vessels, as well as opening and relaxing circulation. Treating fungus. Fresh garlic juice works to inhibit fungi from growing, and has long been used as a topical treatment for jock itch and fungal skin infections. Balancing cholesterol. Garlic has the ability to improve the function of the liver, which is key in moderating healthy cholesterol and triglyceride levels in the body. Halting atherosclerosis. Garlic has a positive effect on halting - and sometimes even reversing - atherosclerosis. Garlic owes most of its medicinal properties to the sulfuric compounds allicin and ajoene. Allicin, an organosulfur compound, is the most potent one, providing garlic with its distinct aroma and its antibacterial and antifungal action. Ajoene, derived from allicin, also has blood-thinning and lipid-lowering action. Other significant compounds found in garlic include glycoside, coenzyme Q10, allyl propyl disulfide, diallyl, trisulfide, and sallylcysteine. Likewise, on a nutritional level, garlic has large amounts of vitamin C, potassium, and phosphorus. Allicin is capable of completely inhibiting RNA synthesis, which hinders the reproduction of viruses and bacteria. When combined with ajoene, it reduces lipid content in the arterial walls, causing deposits of LDL - or "bad cholesterol" - to be oxidized and excreted. ALLICIN CAN HINDER BACTERIAL REPRODUCTION, WHICH MAKES IT A POTENT NATURAL ALTERNATIVE TO ANTIBIOTICS. Calendula and oak also possess antimicrobial properties, while olive and sacha inchi provide similar cardioprotective benefits. Garlic is likely safe for most people when taken orally; however, it can cause bad breath, a burning sensation in the mouth or stomach, heartburn, gas, nausea, vomiting, body odor, and diarrhea. These side effects are often worse with raw garlic. Asthma has been reported in people working with garlic, and other allergic reactions are possible. Garlic may increase the risk of bleeding. People with bleeding disorders or taking anticoagulant medication, as well as those about to undergo surgery, should avoid consuming this herb in medicinal doses. Garlic compounds can cause gastrointestinal inflammation in people who suffer from Irritable Bowel Syndrome (IBS), so those following the FODMAP diet should avoid its consumption in food or supplements. Garlic is generally safe when applied to the skin. Gels, pastes, and mouthwashes containing garlic have been shown to be safe when used up to three months. 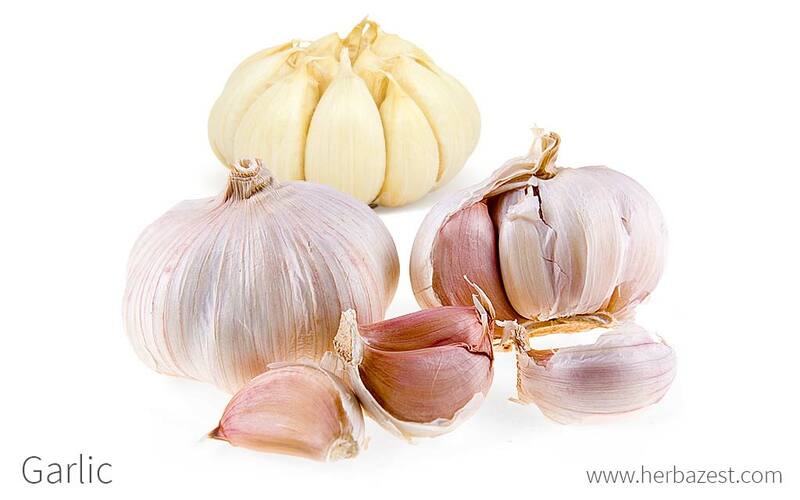 However, the topical application of garlic essential oil might cause skin irritation in sensitive individuals. Garlic is not usually consumed in large amounts; however, it provides a wide range of nutrients that can add up to a healthy diet. Garlic cloves contain fair amounts of manganese, a mineral that is important for the metabolism of carbohydrates and the absorption of calcium, as well as for aiding with blood sugar regulation. They are also an adequate source of vitamin B6 (pyridoxine), which plays a key role in normal brain development and function, as well as helping in the production of serotonin and norepinephrine, two hormones that influence mood, along with melatonin, which helps regulate the body clock. This vitamin is also necessary for proper absorption of vitamin B12, red blood cells production, and immunity. 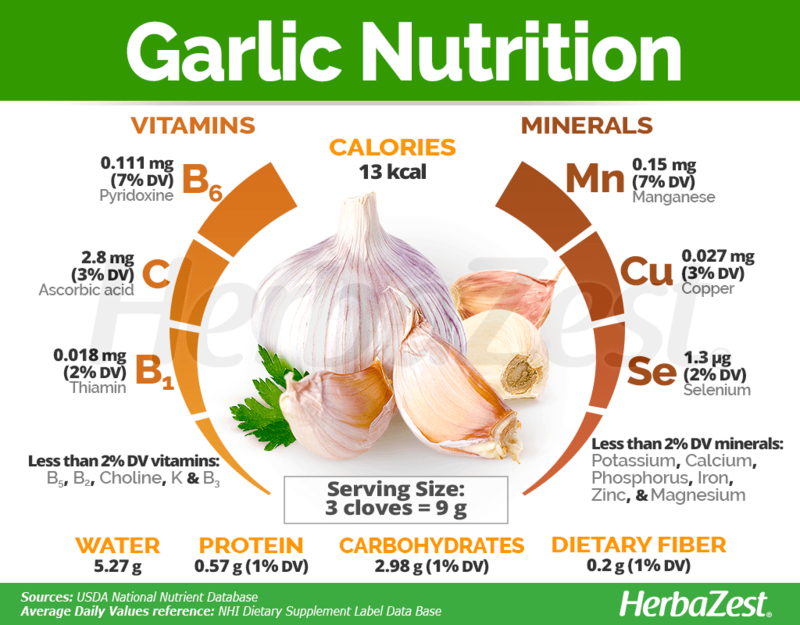 Additionally, garlic provides small amounts of many other nutrients, mainly vitamins C (ascorbic acid) and B1 (thiamin), as well as minerals like copper and selenium. Three cloves of garlic (9 g) provide 13 calories and 1% of the daily value for protein, carbohydrates, and dietary fiber. The highest concentration of allicin is found in raw garlic, which is a staple in most culinary traditions around the world. However, since its taste and scent are strong and considered to be unpleasant for many, a number of medicinal preparations can be used to dilute its flavor and mask its characteristic aroma. Raw. Garlic bulbs are highly regarded as a flavor enhancer for grilled meats, stews, and many other preparations. Consuming garlic in culinary ways is a great way to reap its cardioprotective properties. Dried. With a longer shelf life, dried garlic has a milder flavor and can be used in the same way as the raw bulbs. Pickled. Garlic cloves are often preserved and consumed in this way, frequently combined with other herbs. This type of preparation softens the texture and flavor of garlic, while preserving its medicinal properties. Powder. The dried garlic cloves can be found finely ground, often mixed with salt and other spices, for culinary uses. Poultice. In spite of its strong odor, which can be unpleasant to many, the topical application of crushed garlic cloves is highly effective for treating acne, boils, and athlete's food, as well as for getting rid of warts. Essential oil. 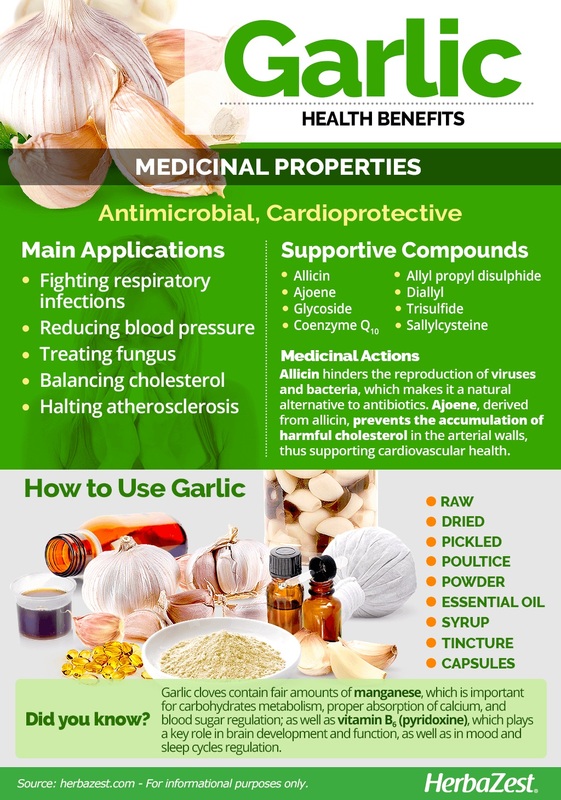 Garlic's essential oil has proven effective lowering blood pressure and preventing the formation of arterial plaque. Syrup. This a popular preparation for relieving cough and other flu symptoms. The pungency of garlic is masked by the sweetness of this herbal remedy. Tincture. Three drops of garlic tincture diluted in a warm glass of water can help keep the flu away and treat minor infections, as well as control fungus. Capsules. This widely preferred garlic's supplement allows for a daily intake and has been shown to reduce cholesterol and blood pressure. However, garlic's antibiotic action is minimal in capsule form. Raw garlic, either whole or pre-peeled, is easy to find in most grocery stores or local markets around the world. In the U.S., the most widely available type of garlic is soft-necked garlic, most importantly the artichoke variety. Thanks to the comeback of farmer's markets and the emergence of slow food and home cooking as eating philosophies, it is becoming increasingly easier to find other gourmet varieties of garlic, such as red, purple, or creole cultivars, although their production is still mostly a small-scale affair. Culinary products, such as garlic-infused olive oil, butter, or pickled products, especially if handcrafted, are also relatively easy to find now in most supermarkets and also big online retailers. THE KITCHEN STAPLE TYPICALLY FOUND IN THE CORNER STORE IS SOFT-NECKED GARLIC - ONE AMONG OVER 300 TYPES OF GARLIC. Garlic supplements are nowadays found in most specialized health stores, and there is a wide variety of choices available through online retailers. Each brand of garlic supplement may come with different concentrations, although they are overwhelmingly more common in capsule and tablet forms. Garlic is an annual plant, and although it has been proven to be highly adaptable, it requires some specific conditions in order to reach its best potential, mostly resembling the soil and environment typical of its natural habitat. Garlic bulbs require full sun and temperatures under 59°F (15°C) in order to grow, and are usually planted in the fall. Garlic grows best when planted in nutrient rich soil, previously treated with manure, and it prefers free draining soils. The individual cloves are planted 4 - 6 inches (10 - 15 cm) apart, pointed tip up, 1.5 - 2 inches (3.8 - 5 cm) deep. In the spring, green shoots will start popping up. Once it sprouts, garlic likes to have about an inch (24 mm) of moisture a week. By June, the shoots of the garlic flower will come up from the center of the leaves. These flower-bearing stems are called the scapes. In order to get a nice large bulb, the scapes should be harvested before they flower. When two-thirds of the leaves are yellow or brown, cloves can be gently dug up. Garlic is a perennial plant, most commonly grown as an annual, and its narrow, flat leaves grows to about 15 - 18 inches (38 - 46 cm) tall. It is similar to onion, but produces a group of small bulbs, called cloves, all enclosed in thin papery scales, instead of a single bulb. Garlic, or Allium sativum, is a member of the Amaryllidaceae family, which contains herbaceous, flowering plants, including approximately 1,600 species. Garlic is also a member of the subfamily Allioideae, which is characterized by its production of allyl sulfide compounds, which give members of this subfamily, such as onion (Allium cepa), chives (Allium schoenoprasum), and leek (Allium ampeloprasum) their characteristic smell, which is also related to their medicinal and culinary properties. Over the course of history, different varieties and subspecies of garlic have been cultivated through selective breeding in different regions of the world. The two main varieties of garlic are hard-necked garlic, characterized by having fewer, but larger, cloves (e.g., purple stripe, rocambole, porcelain), and the more popular soft-necked garlic, which has smaller cloves but is easier to grow. The name garlic derives from the Anglo Saxon gar leac, meaning 'spear plant'. The scientific consensus is that wild garlic originated in Central Asia, somewhere between eastern Europe and western Russia, and was cultivated for semi-nomads more than 10,000 years ago. Garlic spread through the trading route between China and the Mediterranean, and was later introduced to Egypt, the Mediterranean, and India about 5,000 years ago. An Egyptian medical papyrus dating from about 1500 BCE lists 22 garlic prescriptions for such complaints as headaches and throat disorders, and records of garlic extensive consumption have also been found in both Greek and Roman ancient writings. Garlic is the second most consumed plant of the Allium genus worldwide. It is an important component in many cuisines, where it is used mostly as a spice but also as a fresh vegetable. It is produced all over the world, with approximately 2.5 million acres of land devoted to its production worldwide. The world's largest producer of garlic is China, and it is estimated that, in 2011, the worldwide garlic production was worth approximately $4 billion USD. Garlic is used around the entire Northern Hemisphere as a medicinal panacea, and engenders varied responses — those who come into contact with it often either love it or are repulsed by it. Garlic has been said to repel vampires, keep evil spells at bay, and repulse bad energy. Gardening. The raw cloves can act as a great mosquito repellent, and as the base for natural pesticides, mixed with pepper and soap. Pest control. Garlic is also used for pest control on both livestock and house pets, by rubbing the cloves on the animal's skin. Fishing. In certain regions, garlic has also been used as fish bait for bass or trout.